Very, very simple things make me happy this time of year, and fresh flowers from the farmer's market are one of them. Everything has come to life again and is fresh and new. As an event planner, I am constantly inspired by color, texture, and shape, and the feeling those things give me. 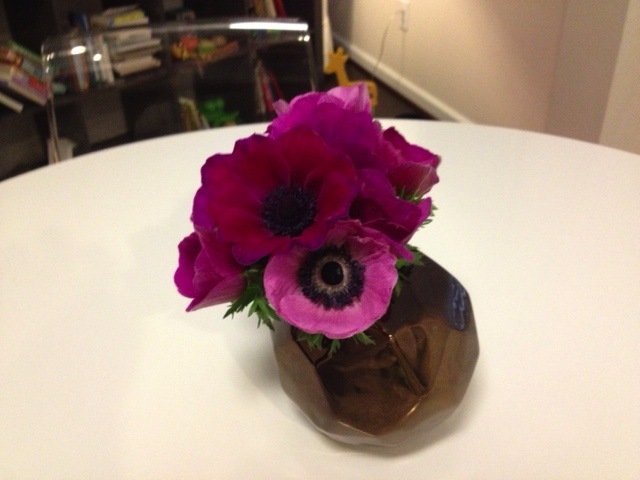 These are anemones from a local farm, Bluebird Meadows. I cut them short and stuck them in a very contemporary, copper-colored vase that was a housewarming gift from a friend. I always love to mix modern with vintage, rustic with elegant, soft edges with hard ones. I'm inspired by the dichotomy of the two. Be aware of your surroundings and be inspired! Sometimes the simplest thing you do around the house will give you a brilliant idea for something bigger. I keep fresh flowers around because they make me happy. When I'm happy, I'm more creative. Everything is connected in that way. Find what makes you happy and in the meantime, allow yourself to be excited by the season - there is so much right outside your door from which you can draw inspiration. I'm an event planner, a new mama, and a lover of pretty things and fabulous parties. My yearbook says I hoped to be a backup singer for Elton John and become the next Oprah, but I'm pretty certain I'm living my dream just the way things are right now.